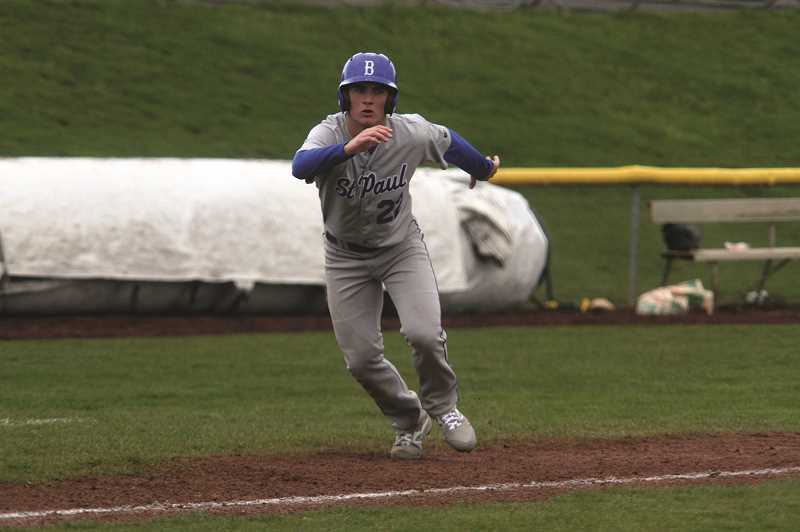 The St. Paul baseball team salvaged a spring break series at Volcanoes Stadium in Keizer by rallying for a 7-6 victory over the Amity Warriors in the final game of the series on Thursday. 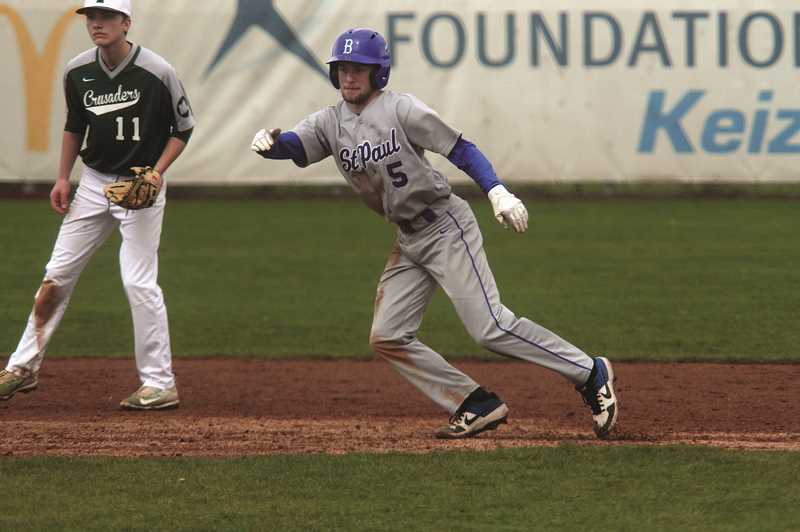 After falling in the first two games of the series, losing 5-1 to Toledo on March 26 and 9-5 to Salem Academy on March 27, the Buckaroos needed to pick up a win over the Warriors to avoid the three-game sweep. Things looked dire after the opening half of play, as Amity dinged St. Paul freshman pitcher Lance Tuck for five runs in the second and third innings to take a 5-1 lead heading into the top of the fourth. But Tuck got the offense rolling, opening the inning with a grounder up the middle and reaching safely on an error by the Warriors — one of five miscues by Amity that proved to be the difference in the game. Hayden Scott walked on the next at-bat, and after Aiden Kirsch struck out, Brody Schindler induced another walk to load the bases for Jaidyn Jackson. The St. Paul senior recorded yet another walk to bring Tuck home, and the Bucks followed with a walk from Efrain Ramirez, making it a 5-3 game with hardly a swing of the bat for the Buckaroos. The Warriors induced Justin Herberger and Reed Overfield into outs to end the inning, but after a scoreless fourth for Amity, the Bucks got back to work in the fifth when Schindler hit a ground ball up the middle with bases loaded to bring Tuck home once again, making it a one-run game. The Warriors tacked on a run in the bottom half of the frame, but the St. Paul bats were on a roll. With two outs on the board in the top of the sixth and bases loaded, Herberger scored on a passed ball to once again draw the Bucks to within one. Kirsch drew another walk to load the bases, and Schindler connected on a line drive to center field to score Scott and Overfield to give St. Paul its first lead of the game since going up 1-0 in the opening inning. From there it was as simple as 1-2-3 for the Bucks to close out the game for the win. Despite the win, St. Paul recorded just three hits total in the game, letting the Warriors do most of their damage for them. In addition to the errors, Amity walked the Buckaroos 12 times. Schindler led the team on offense, going 1-of-2 with his game-winning double, and drove in three RBIs. Steven Coppola and Jackson each recorded hits as well. Jackson led the team in walks, drawing three bases on balls. Ramirez and Overfield each drew a pair of walks. St. Paul (6-3, 2-0 Special District 1) were scheduled to return to league play on Monday against Gaston and travel to Bandon on Wednesday for a non-conference game to close out the week.